Want some quick, natural, and instinctive advice about running in the dark? DON’T DO IT!! You’ll run into things (like tree trunks and branches, spiderwebs, curbs, mailboxes, wire fences, and potholes). You’ll run on things (like surface water, slippery leaves, sand, or gravel) You’ll be run into by things (like cars). You’ll run over things (like cliffs). You’ll be stalked, either by animal predators (uncommon), or by human predators (all too common). But a quick online search demonstrates that many of today’s runners are going to blithely ignore the above sound advice. It seems that, for many otherwise sane people, running is an overpowering addiction. It is going to happen, no matter what. In other words, if you can’t run during the day, we know that you will run at night. So you might as well do it safely and invest in some nighttime running gear. It really does open up a lot more time for running. Running in the dark can be a refreshing escape from the clamor and visual noise of the day. Going for a run at night can help you sleep better. But some of the justifications presented for running at night are just plain silly. Consider the following: “There is something exciting and daring about running outside in the night.” Or “If you’re running at night, it’s pretty hard to indulge in late-night snacks.” And think about this: “You rely less on your eyes when you run at night, and your feel for the ground is greater, so you’re likely to run more effectively and have fewer injuries.” That’s equivalent to saying you will have fewer injuries if you run blindfolded. We trust that our patients are all quite sane. However, we do know that many of you are dedicated runners, so, just to err on the side of caution, we’re passing on some nighttime running tips to ensure your safety. Find the best lit route that is available to you, even if it means abandoning your favorite daytime routes. Before you try it at night, run your nighttime route during the day. You want to avoid as many surprises as possible. Wear reflective material around your ankles, knees, elbows, and shoulders. Reflectors in motion help drivers differentiate you from a mailbox or a shrub. There’s truth to the adage “safety in numbers”! Wear light and bright clothing. Reflective material is only effective when it is hit directly by light. Wear vivid clothes, so that you’ll be seen even when your reflectors aren’t reflecting anything. One of our patients (and friend) owns Runners Lane and they have a good selection of high visibility clothing for sale. Light yourself up. You’ll be a lot more noticeable to drivers when you’re illuminated. Wearable night running lights are available either at your local running store or online. Blinking shoes can also enhance your visibility. Run with friends, like a pack of urban wolves, or with a running buddy. There is safety (and sociability) in numbers. Wear a headlamp or carry a flashlight. Or both. The currently available headlamps and flashlights, designed specifically as night running lights, are becoming lighter and more stable, and you need to see that hole in the ground just ahead. Carry your cell phone, and make sure it’s fully charged. This needs no explanation. It should be automatic, even for those of us who haven’t had our cell phones surgically attached to our bodies. Also, you can load apps into that phone which, with one tap or a swipe, will send emergency messages to first responders and/or designated friends. Some of these apps even provide the responder with your precise location on a map. Running ID tags are an easy way to have personal identification and medical information readily available in case of emergencies. Run against traffic. This gives you a clear view of oncoming vehicles, so both you and the driver can make any last-minute maneuvers. If the headlights obscure or blur your vision, wear a cap or a visor. (Also, the bill of that cap will impact an unseen tree branch before your forehead does). Tell someone the route you’re taking, and when you plan to be home. Ask that person to make sure that you did arrive home safely. Leave your headset at home. You want to maximize your audio awareness just as much as your visual awareness, so let the mockingbirds, nightingales, car horns, snarling pit bulls, and ambulance sirens provide your sonic background. When you approach a car stopped at an intersection, make sure the driver sees you. Make eye contact and get an acknowledgment from the driver before you cross the street in front of a vehicle. Finally, if you are going to run at night, you should take some ID.…for those first responders. Just sayin’. 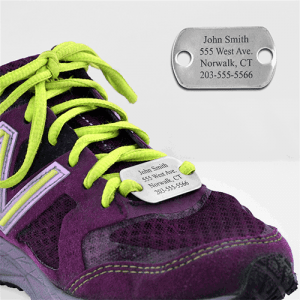 Gone For A Run offers a variety of running ID tags and bands for a convenient way to carry your personal and medical information. We know that many folks love their nighttime runs. So we suggest that, if you must run at night, it’s preferable to do so on a treadmill, in the safety of your home or your gym. And if you’re suffering from plantar fasciitis or any other running related foot problems, please don’t hesitate to make an appointment with UFAI. The doctors at University Foot and Ankle Institute are here to help. Our nationally recognized podiatrists offer the most advanced foot and ankle care together with the highest success rates in the nation. 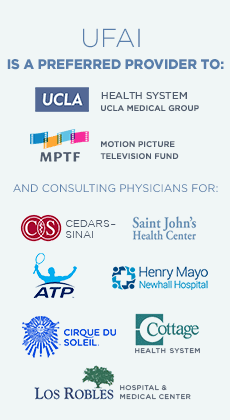 We are leaders in the field of research and treatment of all foot and ankle conditions. After the shoe stretched a bit, all was good. It’s so comfortable to wear and that’s a good thing because I work on a cement floors and do a lot of standing and walking.